File compression is an old trick: one of the first (if not the first) program capable of compressing files was “SQ”, in the early 1980s, but the first widespread, mass-know compressor probably was ZIP (released in 1989). In other word, compressing a file to save space is nothing new and, while current TB-sized, low costs disks provide plenty of space, sometime compression is desirable because it not only reduces the space needed to store data, but it can even increase I/O performance due to the lower amount of bits to be written or read to/from the storage subsystem. This is especially true when comparing the ever-increasing CPU speed to the more-or-less stagnant mechanical disk performance (SSDs are another matter, of course). While compression algorithms and programs varies, basically we can distinguish to main categories: generic lossless compressors and specialized, lossy compressors. If the last categories include compressors with quite spectacular compression factor, they can typically be used only when you want to preserve the general information as a whole, and you are not interested in a true bit-wise precise representation of the original data. In other word, you can use a lossy compressor for storing an high-resolution photo or a song, but not for storing a compressed executable on your disk (executable need to be perfectly stored, bit per bit) or text log files (we don’t want to lose information on text files, right?). So, for the general use case, lossless compressors are the way to go. But what compressor to use from the many available? Sometime different programs use the same underlying algorithm or even the same library implementation, so using one or another is a relatively low-important choice. However, when comparing compressors using different compression algorithms, the choice must be a weighted one: you want to privilege high compression ratio or speed? In other word, you need a fast and low-compression algorithm or a slow but more effective one? Before moving to the raw number, lets first clarify the terminology. A lossless compression algorithms is a mathematical algorithms that define how to reduce (compress) a specific dataset in a smaller one, without losing information. In other word, it involves encoding information using fewer bit that the original version, with no information loss. To be useful, a compression algorithms must be reversible – it should enable us to re-expand the compressed dataset, obtaining an exact copy of the original source. It’s easy to see how the fundamental capabilities (compression and ratio and speed) are rooted in the algorithm itself, and different algorithms can strongly differ in results and applicable scopes. The next step is the algorithm implementation – in short, the real code used to express the mathematical behavior of the compression alg. 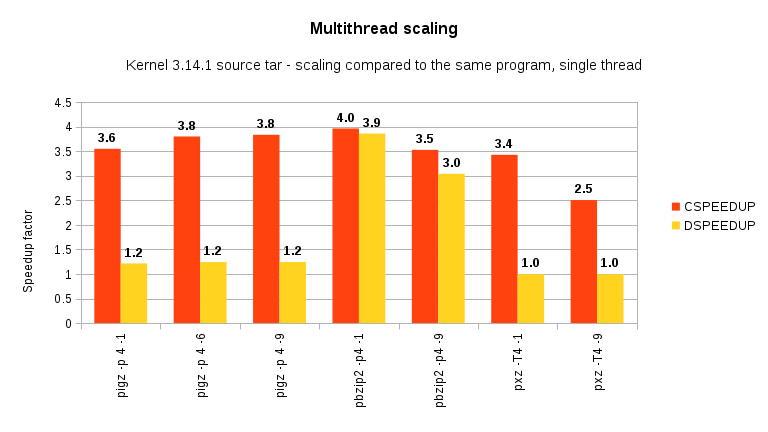 This is another critical step: for example, vectorized or multithreaded code is way faster than plain, single-threaded code. When a code implementation is considered good enough, often it is packetized in a standalone manner, creating a compression library. The advantage to spin-off the alg implementation in a standalone library is that you can write many different compressing programs without reimplement the basic alg multiple times. Finally, we have the compression program itself. It is the part that, providing a CLI or a GUI, “glues” together the user and the compression library. Sometime the alg, library and program have the same name (eg: zip). Other times, we don’t have a standalone library, but it is built right inside the compression program. While this is slightly confusing, what written above still apply. Let start our analysis compressing a mostly executables-rich dataset: a minimal CentOS 6.5 root image. Executables and binary files can often be reduced – albeit with somewhat low compression ratios. As you can see, both lz4 and lzop maintain their promise to be very fast, both at compression and decompression – albeit lz4 is the absolute winner. On the other hand, they have relatively low compression factor. However, ask them to increase their compression ratio (via “-9” switch) and they slow down immensely, without producing appreciably smaller files. 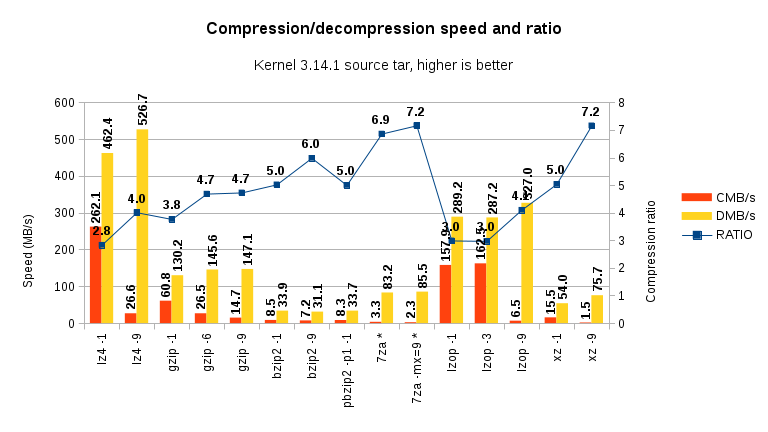 Gzip and especially bzip2 shows are not so good – while their compression factor is better (3X), they suffer a massive performance hit. 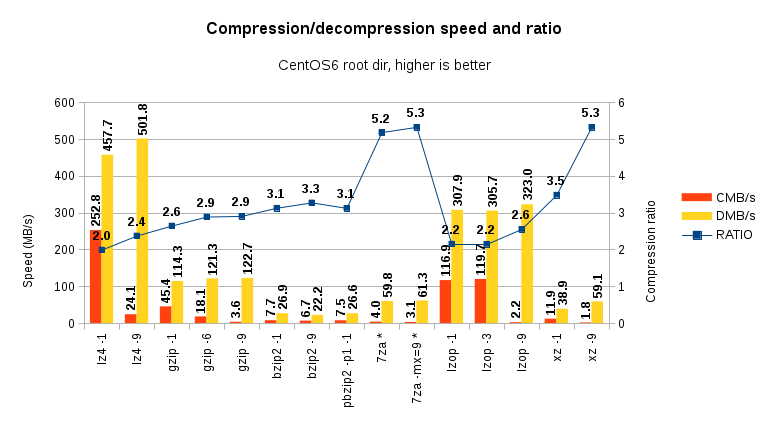 7-zip and xz have very low compression speed, but very high compression ratio and acceptable decompression speed. 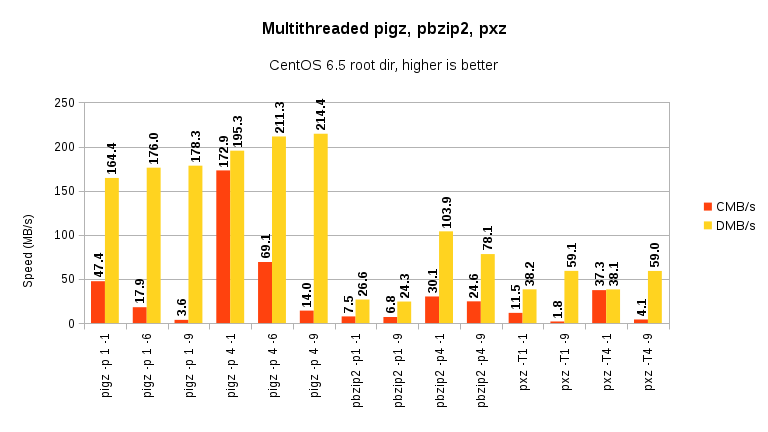 Pigz, pbzip2 and pxz all produce way better results than theri single-threaded counterparts. 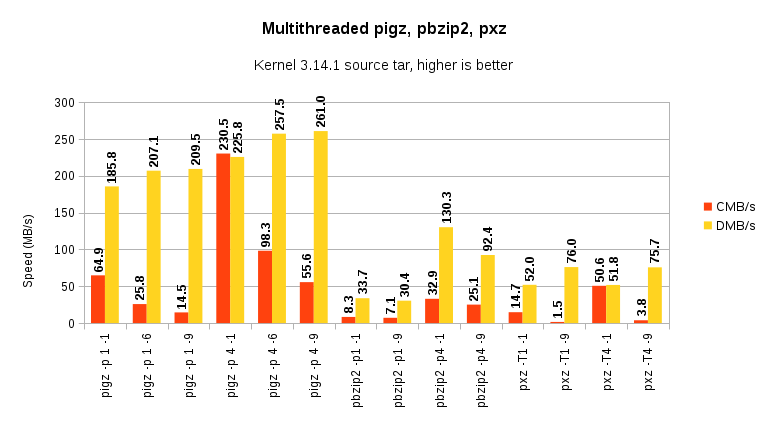 However, while compression scaling is often very good, only pbzip2 is capable of decompression acceleration also. lzop is considerably faster at compression compared to the previous run. Compression scaling remain excellent, with pxz in the last place. 7zip basically is a close relative of xz, but it main implementation belong to the windows ecosystem. Under Linux, simply use xz instead of 7-zip. Also, Rar is a file archiver with a very high compression ratio. It would be really interesting to see what are the advantages of Rar and how it performs against other compressors in a Linux environment, especially on a Linux VPS.